Sometimes the worst thing about being a creative person is how easily you can get very imaginative in all the wrong ways. And any difficult thoughts sometimes seem to have a very energetic and persistent life of their own! And the harder you try to suppress the difficult thoughts, the more they keep popping colourfully and insistently back into your mind. It’s so frustrating! So what can you do? Well, lots of studies have shown that trying to suppress difficult thoughts (or any thoughts, for that matter) just doesn’t work. It isn’t that you lack self-control. And what’s more, trying to avoid or push away thoughts or feelings, can lead to difficulties like anxiety, depression and even phobias. But the good news is, there are ways that using the arts and imagination can help. Your creativity can be channelled to come to the rescue. Below, I offer a few ideas. But first, an important note: If unwanted or difficult thoughts are a problem for more than a few days, do consult your GP or primary care physician (or your therapist if you have one). This article does not constitute medical advice or treatment, and cannot replace any advice from your doctor or a mental health professional who knows you. Try a few affirmations – but the trick is to choose ones that both accept the difficult thought and also affirm your worth. If your difficult thoughts are about a moment when you got things wrong in some way, try ‘I make mistakes sometimes and I’m okay – I don’t have to be perfect’. If you’re filled with painful thoughts about a relationship that went wrong, try ‘even though it didn’t work out with X, I am still loveable’. Use art materials to illustrate your affirmations: you could go big and make a poster, or tiny and discreet, like a decorated matchbox or a mini booklet the size of a couple of postage stamps. 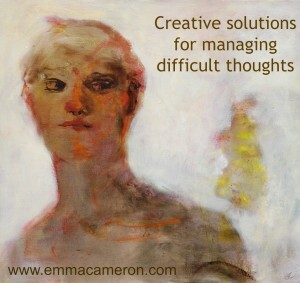 How about focusing deliberately on the difficult thought when it comes up? See if you can get a clearer image of it. With the difficult thought in mind, let your awareness drop down into your body. If the difficult thought was an animal, or a colour, or a shape, or a house, what would it be? What qualities would it have? Could you paint it, draw it, or use play-dough to depict it? Sometimes we use far more energy trying to avoid a thought, than it would take to embrace the thought and see what we can learn from it. This sort of approach is far better than avoidance, and can help take the power and sting out of our fears. Getting stuck in to any activity that you find really absorbing puts you in a state that psychologists call ‘Flow’: where for a while you almost lose track of time and just immerse yourself in an experience. Gardening, fixing something, cooking, or reading a novel: it all depends on what works for you. Try wetting some thick paper and dripping watercolour paints on to it, and enjoying what the colours do as they meet. Or find an interesting object, such as a shell or a piece of driftwood, and concentrate on drawing it, using charcoal or soft pencil. Make sure you give yourself permission to accept your drawing (however imperfect it may appear) instead of criticising it – this will make the exercise much more effective. Get a blank notebook, and fill it with a mixture of writing and images. Don’t aim for neatness or perfection: this is a private place where you can splurge. Write about the painful thing, but be imaginative and write about it from different perspectives. For example, when you did the embarrassing thing that has been making you cringe in shame, what might the scene have looked like to the bird who was sitting on a nearby branch watching? Imagine a very wise, loving old person – what might they have to say to you? Your aim is to take the ‘heat’ out of the difficult thought, and see it as part of the wonderful, varied tapestry of living. Still difficult, perhaps, and still important – but no more so than many, many other elements that make up your experience. Sometimes when we are trying to avoid painful or persistent thoughts, we think it will help to keep busy, give ourselves too much to do, and generally get a bit stressed. Guess what: stress will actually make things worse! Instead, take yourself kindly by the hand and allow some nurturing, calming things into your life. A yoga or pottery class, knitting, or just half-an-hour walking by the river, can help get some balance in your life, and make you more resilient and able to handle the difficult stuff. Wrestling with an unwanted thought can be like thrashing about in quicksand: you just get stuck further and further in. Instead, try observing your thoughts. Get still, calm your breathing, and picture in your mind a circus ring, or a parade, with performers walking round or along. Each one is holding a sign with your difficult thought on it. See if you can simply watch them go by, accepting what they are and letting them move on. Don’t argue with the signs, and don’t try to make them disappear: just watch them. You may begin to feel calmer after a while. Distraction might help in the short term, as long as it doesn’t become your main way of dealing with difficult thoughts. But remember: it’s actually best to distract yourself with one thing, and not jump from one focus to another. Try doodling with a pen. Start with a flower motif, or a geometric shape, and let your doodle grow and develop. Try not to judge it – remember, a doodle can really be anything. See if you can just enjoy the ways the doodle gradually takes shape. Let yourself get absorbed in the swirls, the dots, the lines, the zig-zags. This isn’t time-wasting: this is you making a peaceful space for yourself where you can just be, and not have to fit into anybody’s idea of who and what you “should” be. Have a go and see what helps! The above suggestions are just a few ideas. Notice particularly any that initially appealed to you for a second, but then got dismissed. What does that dismissing voice say? ‘That’s just silly’, ‘that would be a waste of time’, ‘that’s not what people like me do’, ‘I’m not good enough/ brave enough/ talented enough to do that’. Bear in mind that the ideas that got dismissed might be exactly the ones to try out! Some of the suggestions may simply be unappealing or unhelpful for you: that’s fine, they may not be right for you. And do listen out for any alternative ideas that pop into your head – those might be the ones that are precisely tailor-made for what you need! If you like the idea of learning how to understand and manage yourself better through tapping into your creativity, Art Psychotherapy might be a good choice for you. And if your unwanted and difficult thoughts last more than a couple of days, or if they begin to affect your day-to-day life in any way, do talk to your doctor. Whether it’s counselling, psychotherapy, medication, or something else, there is definitely help out there for you. Good luck! And do share what works for you, in the comments below.